Gale Pitt There are 2 products. 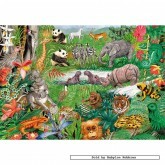 Gale Pitt has included jungle creatures for every letter of the alphabet in this colourful picture. See if you can spot them all. In stock and ready to ship out. 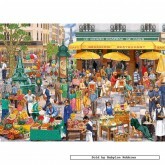 A 1000 pieces jigsaw puzzle made by Gibsons (reference G6022). Size: 68.5 x 49 cm (= 27.0 x 19.3 inch). Special series: Gale Pitt.